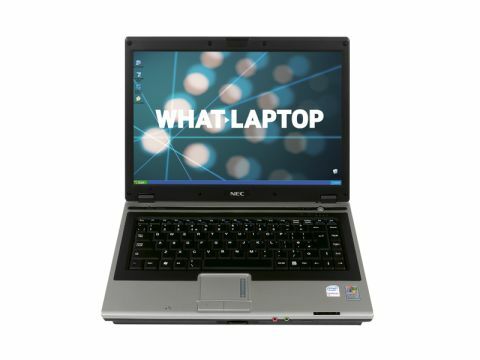 With a lightweight chassis, matt screen and a choice of Windows XP Professional or Vista Business, the NEC Versa S970 is a laptop intended for corporate use. The 14.1-inch screen is a standard TFT panel. Without a glossy coating, colours appeared slightly subdued. It's one of the best laptops to use out on the road, however, where reﬂections and dust remain hidden. With no need to run 3D games, the NEC uses an integrated graphics card. This helps the laptop to achieve a battery life of over ﬁve hours. There's plenty of space for a good-sized keyboard, and the keys are large enough to make it easy to type at speed. It's not particularly quiet, however, and we found the board ﬂexed around the edges under pressure. The touchpad is slightly cramped, but it's responsive and easy to use. Despite its 14.1-inch chassis, the NEC weighs in at just 2kg. We found this an ideal laptop for travelling, as the light weight was a bonus over longer journeys. Thanks to a 2.2GHz Intel Core 2 Duo processor, it's also a powerful laptop, running applications smoothly and with little lag. The 160GB hard drive is not the largest available, but it should provide enough storage space for business users. You'll be able to connect to networks using the Gigabit Ethernet adapter once you get to the ofﬁce, and wireless networks can also be joined using 802.11a/b/g Wi-Fi. Bluetooth is included for transferring your ﬁles wirelessly to other digital devices. A lot of the other machines can better the Versa S970 in speciﬁc areas, but it remains a compelling choice for those seeking a lightweight machine without compromising on size or power.